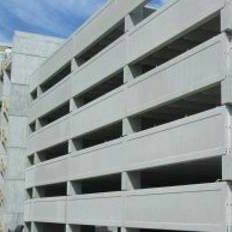 Precast concrete spandrels are a key component in our Lafarge precast structural precast systems, used in conjunction with other key products on structural projects like precast parkades. A key reason for this is that precast concrete spandrels are excellent for transferring working loads to structural columns and beams. Spandrels often have a decorative architectural sandblasted finish to enhance the aesthetics of the structure.